Discussion in 'Tarantula Questions & Discussions' started by Matabuey, Sep 16, 2016. Great read, really great read. I have an interesting story. When i was young an messing w/true spiders all the time i got bit all the time too. The doctors said i developed an alergic reaction to them and warned me about my tarantulas (which 20 yrs later i still keep). When i got bit on this particular occasion i became very itchy around my eyes (similar to pink eye) and my eyes so kets actually swelled up bad enough they were worried about my eyes. My airway did not close up but did swell a little. They gave me an injection of some sort (corticosterioid i assume) and sent me home w/some sort of steriod pills to take. Everything worked out ok and to my knowledge i have not been bitten since and never been bitten by my T's. Looking back at that vs what the doctors said about me being alergic an such. I wonder if i were bit by say my P. met, wouod it be worse for me then the populous? What im essentially curious about is everyone is always talking about how pokies are so advanced an have such a nasty bite so how bad is it really and whould it be worse for me? Doctors dont know everything so perhaps im not allergic but just curious how a T's venom stacks up to true spiders in general and if its true i am "highly alergic" (thats what they said), how could i possibly react to a pokie bite? That does sound like an allergic reaction on some level, not the greatest - obviously. But in terms of if you were to take a pokie bite, true spider venom and tarantula venom are very different in composition. You wouldn't be allergic to a pokie, but you may well be allergic to another true spider that shares the same compounds in their venom that you're allergic too - from the true spider you were bitten by. Such as, if you become allergic to cobra venom, you're quite likely to also be allergic to a large group of elapids that contain 3 finger toxins. How does T venom stack up compared to true spiders? There's too much a disparity between invidivauls to say. Some true spiders are totally harmless and some are reasonably dangerous (not many people die from even very toxic true spiders these days). But T's are not life threatening, unless in very very very acute circumstances. So if you're worried about being possibly allergic to a pokie after your experience with a true spider - you don't need to be. Unless of course you get bitten multiple times by a pokie - but even then it's a long shot due to the reasons listed in my original post. Has this ever gotten excessively complex, even bordering of messianic. I have heard putting a turnoquet above bite site can stop the spreading of the venom. This is wrong. When one does this, the region cut off is now subjected to a much more concentrated amount of venom. This significantly increases the effects of the venom to a localized region, not good. This is particular not good with venom that causes necrosis, such as Brown Recluse Spider venom. Even if a rattlesnake bit a person, still not a smart idea. I've spoken to a venom expert on this one. Peripheral venous profusion restriction by mechanical or chemical intervention vs arterial. What mechanisms are available and what vital sign indicators must be monitored in each instance? If you didn't whip out the correct answers, you aren't qualified to use a tourniquet. Okay? Said, done, finis. VENOMS. Read, poisons. They act upon certain biological functions of certain animals. Depends on the venom, depends on the animal, depends upon the delivery mechanism, depends upon the quantity, depends upon the profusion, depends upon the metabolism, depends on the sensitivity and the condition of the immune system of the patient. The effects of venoms are reasonably predictable, but obviously unless you are a medical expert with an extensive battery of tests available, consulting an expert is in order when you are in doubt. Example. Take a Paramedic with a couple of decades of trauma experience inclusive of numerous envenomations. After the BLS, what does the Paramed do? CALLS THE ER TO GET EXPERT ADVICE!!! Allergies and allergic reactions. Anaphylaxis. HYPER as in big time. lots lots. Sensitivity. A reaction or response to an invasive chemical, sometimes out of all proportion to the quantity of the chemical introduced to the body. IE, the body immune system and related physiological responses go berserk. Bananas. Freak out. Hypersensitivity can compound the problem. Make it worse. And since hypersensitivity uses both the blood stream and the neuron pathways, the physiological responses may be entirely unpredictable. Example: typical classical anaphylactic reaction to Penicillin. Up to ONE WEEK AFTER the drug is administered, an intense itching occurs. The itching may be localized or involved the entire body. The itching is so extreme patients commonly have to be physically restrained to keep from scratching and causing bleeding abrasions. And last, shock. Shock can kill. Shock takes many forms from numerous causes. The body can go into shock from simply seeing something. People who watch and thoroughly enjoy shocking horror movies are actually enjoying their physiological chemical responses to psychogenic shock. Chemicals released causing mild euphoria. Shock of some degree commonly accompanies just about any trauma. It accompanies envenomation, physiological and systemic shock. It accompanies anaphylaxis, anaphylactic shock. NEVER DISCOUNT SHOCK. The trauma may be trivial but the shock from it can cause clinical death. How do you explain what happened to a user cold blood acquaintance, that after a 'Pokie' bite (sorry man I don't remember now which 'Pokie' was) had her arm completely turned 'gray' like a George A. Romero 'zombie' for a pretty nice time? I mean, wasn't that a sort of allergic reaction? cold blood posted the pic, btw. Was impressive. Are you saying the information I learned from a venom expert, is wrong? If so, hope you don't use a tourniquet and die some day! I'll trust a venom expert who works with venomous snakes any day on what to do or not to do when bit. No, most likely just a bit of cyanosis - lack of oxygen in the blood in that particular area. Although from my memory, when i saw the pic i swear it was really poor quality - so was hard to tell the extent of it. Great information, thanks for sharing! Often touted as the most dangerous/toxic Tarantula around, but is it? We simply do not know, from reading the many bite reports around on this forum and several others, to me it seems as if systemic effects from Stromatopelma are of no greater medical significance than those symptoms produced by Lampropelma, Poecilotheria, or Haplopelma, etc. I actually cannot find anything to support the notion that this tarantula is the most dangerous. He has a blackboard, chalk and an eraser. That makes him a teacher. What an informative piece! Thank you. Being new to the hobby I appreciate information like this. The fear of spiders is at the heart of the misinformation. The uninformed overestimate the level of risk and seize upon any opportunity to malign spiders. I've read this post 10 times. The original data about peptide binding and immunosuppressive activity as it relates to anaphylaxis are the key element. Therophosid venom categorically has an incorrect molecular structure to induce anaphylaxis reliability. I suspect their may be comorbidity in cases where the outcome is anaphylactic. Serious nerve disruption causing pain response is in and of itself not harmful, just very uncomfortable. As to the response that spoke of shock causing complications, I suspect other comorbidities are present in those cases as well. 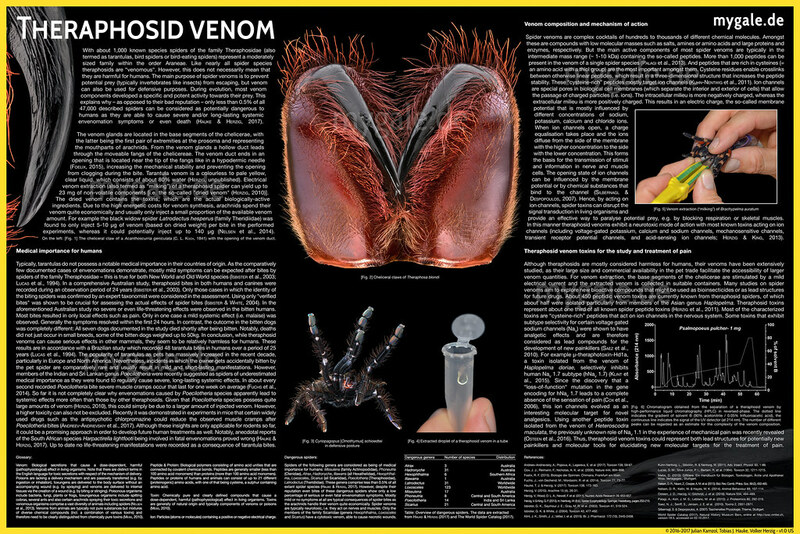 There is a lot of misinformation on these boards and other boards dedicated to tarantulas, with regards to their venom. I don’t particularly blame anyone, as often they’re just regurgitating what they’ve read elsewhere. As many of you have seen, I have had a lot to say on the subject. I’m no toxicologist, but I have spent a lot of time trying to digest information that is presented in papers relating to venomous animals on the whole – ever since I started keeping venomous snakes. There may be some people who haven’t read my previous comments, so I will be including them in this thread (sorry to those of you, whom have read parts of this before), as well as new information/facts relating to tarantula venom and anaphylaxis. I actually cannot find anything to support the notion that this tarantula is the most dangerous. The disposition of the animal has most likely contributed to this inflated perception. I would say it's actually completely incorrect to suggest it's the most dangerous, or "most potent tarantula" without adequate research. Often phrases such as “potent venom”, “highly toxic”, “incredibly dangerous”, “life threatening”, are wrongly used to describe this species. These phrases should be synonymous with animals that pose a serious and immediate risk to one’s life, not an animal with a mildly ‘toxic’ venom. Part of his post, has potentially contributed to this notion that this is the most dangerous Tarantula around. This part in particular “I am sure that, without the immediate intervention of a primed and ready venom extraction kit, this young fellow might well have died” – categorically incorrect. Further to that his comment “Stromatopelma is the link between the relatively harmless mass of Theraphosids, and the few species that can be life-threatening to man.” – A view that is supported by… no one else or any data. The document linked below, categorically states just how ineffectual extraction kits are, and how they can actually worsen effects of the bite – from a world renowned expert on clinical envenomations. (His view is supported by pretty much any medic or toxicologist worth their mettle). The only means we have of determining how dangerous a venomous animal is, is by the rough approximation, LD.50 and known deaths. The LD.50 is around 8.1 mg/kg for a young female, and 9.5 mg/kg for an adult male. The max average yield from a young female is 18.7 mg - thus it is able to kill a 2.3kg human. The max yield obtained from a young female, was 46.6 mg - able to kill a 5.75kg human. The max average yield from an adult male 13.4 mg - able to kill a 1.4kg human. The max yield obtained from an adult male 49.6 mg - able to kill a 5.22 kg human. While this method is not the most accurate in every single scenario, however when looking at the majority of venomous animals and their LD.50’s – usually the ones with the lower number, have proven to be the most dangerous to humans (providing they have a large enough yield – obviously). You can compare Oxyuranus microlepidotus (inland taipan – 0.025 mg/kg sc) to Crotalus lepidus klauberi (banded rock rattlesnake, 23.95 mg/kg sc), or P. nigriventer (brazilian wandering spider = 0.13 mg/kg iv) to S.calceatum (Feather leg baboon – 8.1 mg/kg iv), and those with the lower LD.50 are considerably more dangerous. However, I said usually for a reason. There are a few exceptions to this, such as Atrax robustus (Sydney funnel web), has a relatively low standard LD.50 value, but its clinical effect on humans is much greater than expected. Also when comparing Tropidechis carinatus (rough scaled snake) which has a low LD.50 in mice, compared to a snake with higher LD.50 in mice, Notechis scutatus (tiger snake). You would assume N.scutatus to be more medically significant, yet they’re almost as dangerous as one another when considering clinical effects in humans. Having said that, it can be shown from the countless envenomations from tarantulas, that humans do not react in an unexpected fashion. So it would be plausible to use LD.50 values as a reasonable approximation, for toxicity towards humans. There are many wrong figures on these boards, such as people stating that some species have an LD.50 of 0.7mg/kg. But they must’ve skimmed over the part where they said they isolated a particular toxin. Which is completely different to an actual envenomation, as you’re not just injected with a particular toxin, you’re injected with the full cocktail, as well as the proteins, you have things such as inorganic ions and salts, free acids, glucose, nucleic acids, free amino acids, etc. For example, that 0.7mg/kg of a particular toxin, may ‘reside’ in 30 mg of the other constituents, so the actual LD.50 will be much higher. It goes without saying, the larger the yield, the more dangerous said animal will be to you – it’s one of the other factors to consider. If a Taipan could inject 2000mg, it would be more dangerous than one that could only inject 0.000001 mg.
Tarantulas simply do not have the capability to produce enough venom to be life threatening in the majority of situations. A 6 month old child? Yes. Venomous animals will rarely give their full yield in a defensive bite, which is another factor to consider. Venom is a highly precious substance that requires lot of resources for a venomous animal to produce. T’s can also dry bite, even Satan himself - S.calceatum. As an interesting side point. Yields can be affected by state of nutrition (not in the way you’d necessarily think at first), and moulting. Taking into consideration the opisthosoma/prosoma ratio, and time from moulting, some interesting things were found – with Coremiocnemis tropix. Yields from T’s are far too low to cause any real concern, many species haven’t been studied to obtain yields, but it’s fair to say this covers enough to give a rough idea. We aren’t going to have any tarantulas producing 100mg of venom. To date there have been no deaths recorded for any tarantula species. Others will claim “They have killed, we just don’t know it yet” – which simply doesn’t hold any water. There are enough cases of envenomation, in captivity and in their natural habitat – yet, not a single person has a death to report. I could say the same for Boiga dendrophila, and label it a life-threatening species – incorrectly. In 99.9% of cases it will not kill, thus isn’t ‘worthy’ of the title “life-threatening”. What would we then call highly dangerous spiders or venomous snakes…’Extra life threatening’? It is all too easy to suggest they’ve killed without any supporting evidence. Even when Phillip went to Sierra Leone, no one had a death to speak of – it’s not something people forget. It is also a story people would pass down generation to generation, so the children know to be wary of these animals. 9 people were bitten in his short trip...for these plantation workers, being bitten would seem to be a relatively common occurrence. In Cambodia, for example, children hunt tarantulas to eat – young children would almost certainly have been bitten by OW’s, but still there are no deaths to report. I recently spoke to Wolfgang Nentwing over a few brief emails, if you’re unaware who he is, he has been at the forefront with regards to spider venom for several decades now. He gave me his permission to share the details. He put it quite succinctly: “There is no lethal risk from tarantula spiders. A few genera among them (Poecilotheria) are more dangerous than others”. This last quote, is more so to do with my points on anaphylaxis which will come later. Obviously, in very acute circumstances a tarantula may well kill someone, but they should not be labelled, potentially deadly, incredibly potent, highly dangerous, or any of these ridiculous phrases that are so often used. Tons of interest in this topic and speculation, some correct to a degree and others not so correct. So far there isn’t an actual case to study with regards to anaphylaxis and tarantula venom. Unlike venomous snakes or Latrodectus which have produced anaphylaxis – but there may well be a good reason for that. In general tarantula venoms consist of much smaller proteins, as outlined by Wolfgang, the neurotoxins are around 5 to 15 kDa (50 – 150 amino acids), compared with that found in Latrodectus which are as large as 140kDa (1400 amino acids), some proteins in venomous snakes can be as large as 350kda (3500 amino acids). Anaphylaxis is already a rare event, whether it’s from venomous snakes or true spiders. But there are no cases in people who are bitten by tarantulas – more than once. Important to add here that, you cannot suffer anaphylaxis on your first exposure. When you hear of people suffering anaphylaxis from a Bee sting on their “first exposure”, they often were too young to remember the first time they were stung, or they have been stung by other vespids – which share some of the same common allergens. Why might that be, that we haven’t seen a case of anaphylaxis from Tarantulas, when there are so many keepers of these animals around the world? For a protein to elicit anaphylaxis it must meet several conditions. One of those conditions, is size of the protein. Naturally it follows, the larger the amino acid, the more IgE binding sites are present, thus being much more immunogenic. Tarantulas also contain nucleic acid, which is a poor immunogen by itself. Potent immunogens, are those over 100kDa, and those below 10kDa are said to be weak immunogens (T venom is mostly below 10kDa). (http://megaslides.com/doc/1395182/immunology) – page 52 states this, and you can bring up various papers on the internet that also state the same. Is it possible to suffer anaphylactic shock to tarantula venom? From the information we have, and our understanding of how anaphylaxis works – yes, it is possible. BUT considering that anaphylaxis is rare in venomous snakes or Latrodectus sp, which contain much more potent immunogenic constituents, and that tarantula venom is primarily made up of weak immunogenic constituents, it would be wise to assume that it is unlikely one would suffer anaphylaxis. A view that has been shared by other toxicologists/immunologists previously. These animals deserve respect, because they can cause some systemic effects. But are they deadly? No. Are they highly venomous? No. Are they likely to kill a young child or an adult? No. Could they kill a 6 month old baby or a frail elderly person? Quite possibly. Could they kill a loved pet? Quite possibly. So just like you wouldn't let a Burmese python escape around your pets, or young family, it's wise to be prudent with any animal that is armed with venom. Great read!!! Thank you for the information!